A frame is considered rigid when its beam-to-column connections have sufficient rigidity to hold virtually unchanged the original angles between intersecting members. In this system, shown in Fig 3.2, lateral loads are resisted primarily by the rigid frame action; that is, by the development of shear forces and bending moments in the frame members and joints. The continuity at both ends of beams also assists in resisting gravity loads more efficiently by reducing positive moments in beam spans. Moment frames have certain advantages in building applications due to their flexibility in architectural planning. They may be placed at the building exterior without undue restrictions on their depths. 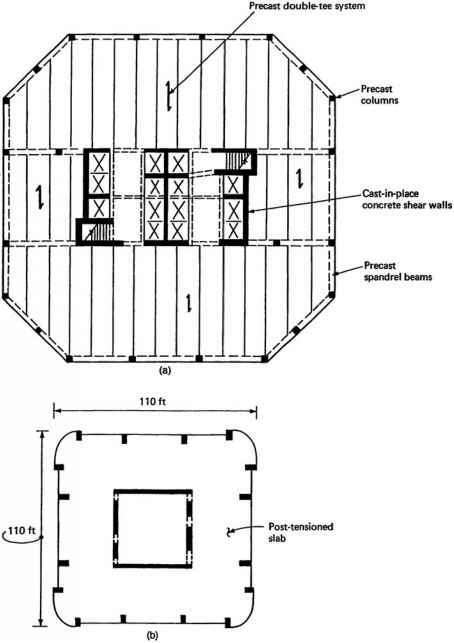 They may also be located throughout the interior of the building with certain limitations on beam depths to allow for passage of mechanical and air conditioning ducts. Because there are no bracing elements present to block lease space or window openings, they are considered architecturally more versatile than other systems such as braced frames or shear walls. The depths of frame members are often controlled by stiffness rather than strength to limit story drift under lateral loads. The story drift is defined as the lateral displacement of one level relative to the level below. It is of concern in serviceability checking arising primarily from the effects of wind. Drift limits in common usage for wind designs of buildings are of the order of 1/400-1/500 of the story height. These limits are believed to be generally sufficient to minimize damage to cladding and nonstructural walls and partitions. Figure 3.2. 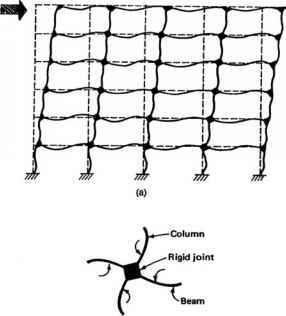 (a) Response of rigid frame to lateral loads; (b) flexural deformation of beams and columns due to nondeformability of connections. The inherent flexibility of moment frames may also result in greater drift-induced nonstructural damage under seismic loading than in other systems. It should be noted that seismic drift AM, including inelastic response of buildings, is typically limited to 1/50 of the story height, about 10 times larger than the allowable wind drift. The strength and ductility of the connections between beams and columns are also important considerations, particularly for frames designed to resist seismic loads. Take, for example, the welded moment connection details used in North American seismic regions during the 25 years preceding the Northridge earthquake, which are shown in Fig. 3.3. The connection typically consisted of full-penetration field-welded top and bottom beam flanges, and a high-strength bolted shear tab connection. It was believed that this type of connection was capable of developing large inelastic rotations. The Northridge, Richter magnitude 6.7 earthquake of January 17, 1994 in California, which caused damage to over 200 steel moment-resisting frame buildings, and the January 18, 1995, Richter magnitude 6.8 earthquake in Kobe, Japan, have shaken engineers' confidence in the use of the moment frame for seismic design. In both of these earthquakes, steel moment frames did not perform as well as expected. Almost without exception, the connections that failed were of the type shown in Fig. 3.3. The majority of the damage consisted of fractures of the bottom flange weld between the column and girder flanges. There were also many instances where top flange fractures occurred. In view of the observed brittle fracture at the beam-to-column intersections, new connection strategies have been developed, and most building codes are being revised. The new game plan typically consists of designing beams such that the plastic hinges form away from the column face. Current moment frame design practice in regions of high seismicity is addressed later in this chapter. Figure 3.3. 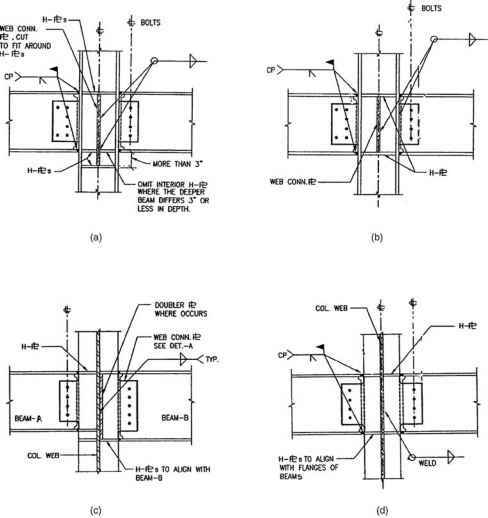 Pre-Northridge moment connections: (a) unequal-depth beams to column flange connection; (b) equal-depth beams to column flange connection; (c) unequal-depth beams to column web connection; (d) equal-depth beams to column web connection.